Pour afficher ce message en français, cliquez ici. 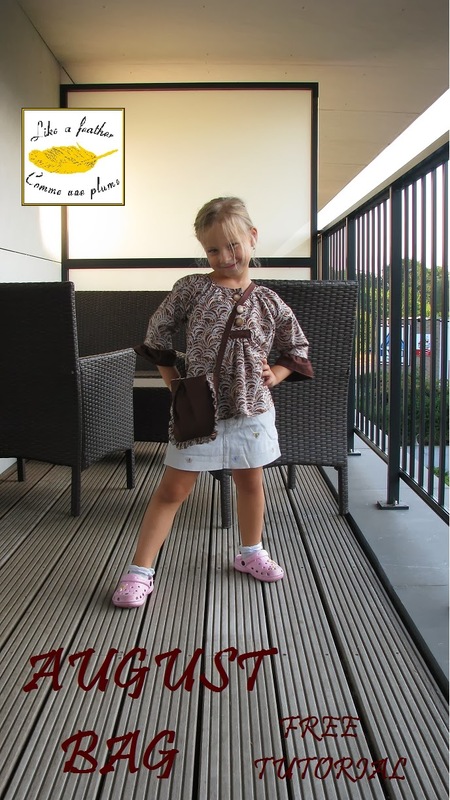 In the case you use this tutorial, I am looking forward to see the pictures of your creation and of course I would really appreciate your feedback (do you find the tutorial clear enough? are there any errors in it? did I forget to mention anything important? etc.). 1/ First of all, print the pattern. It is supposed to be printed on A4 format paper. 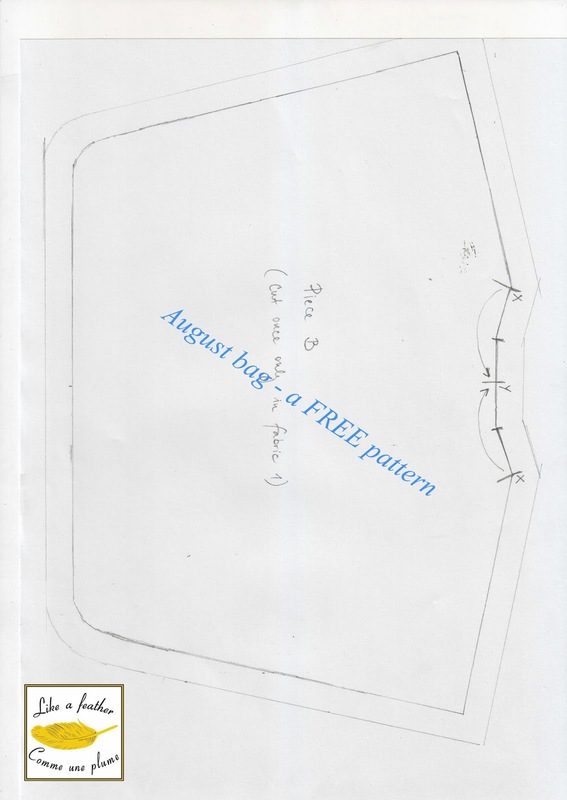 You can enlarge the pattern while printing if you wish to. 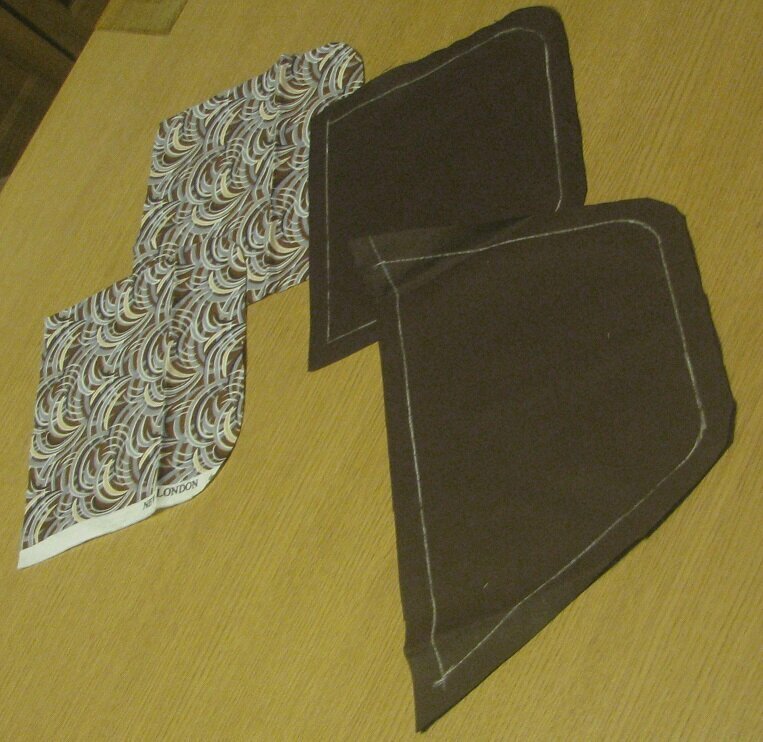 Cut the pattern pieces (cut the piece A once in fabric 1 and twice in fabric 2. Cut the piece B once only - in fabric 1). 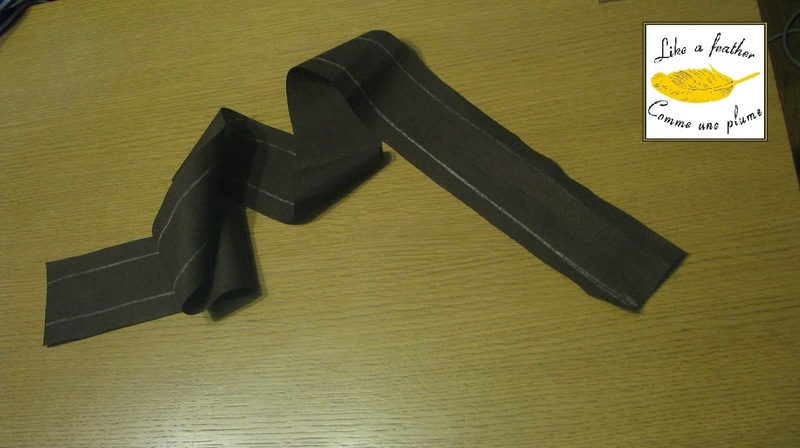 The seam allowance of 1 cm is included and marked on the pattern. 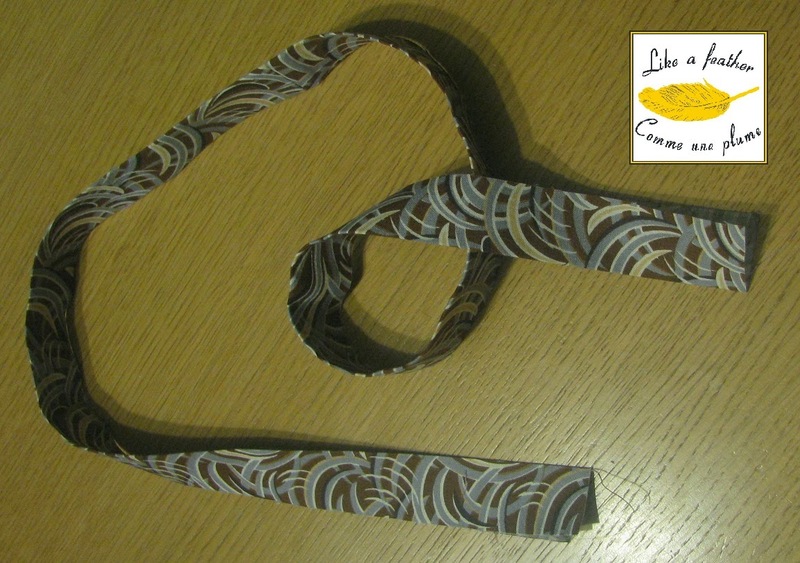 2/ For the ruffle, cut a strip 95 - 100 cm long and 8 cm large in fabric 2. 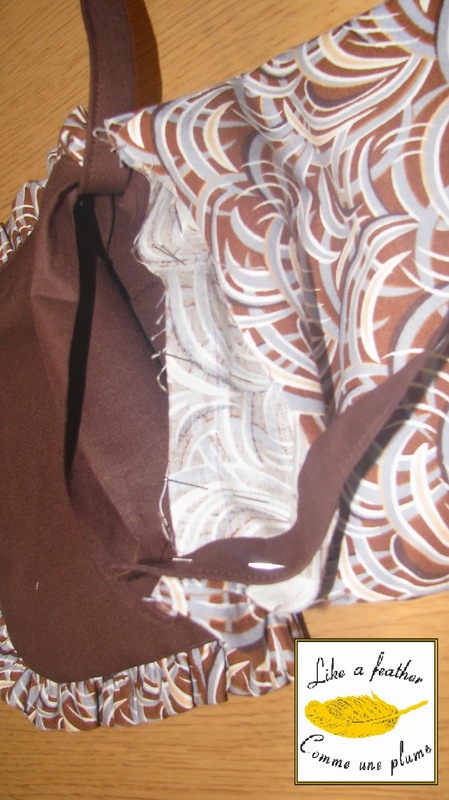 As I did not have enough fabric left, I used two shorter strips that I had sewn together. 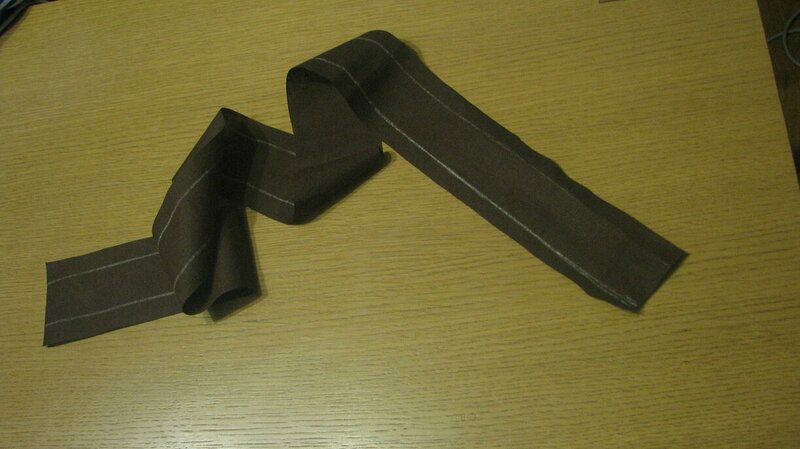 3/ To make a shoulder strap cut a strip 78 cm long and 4-5 cm large. 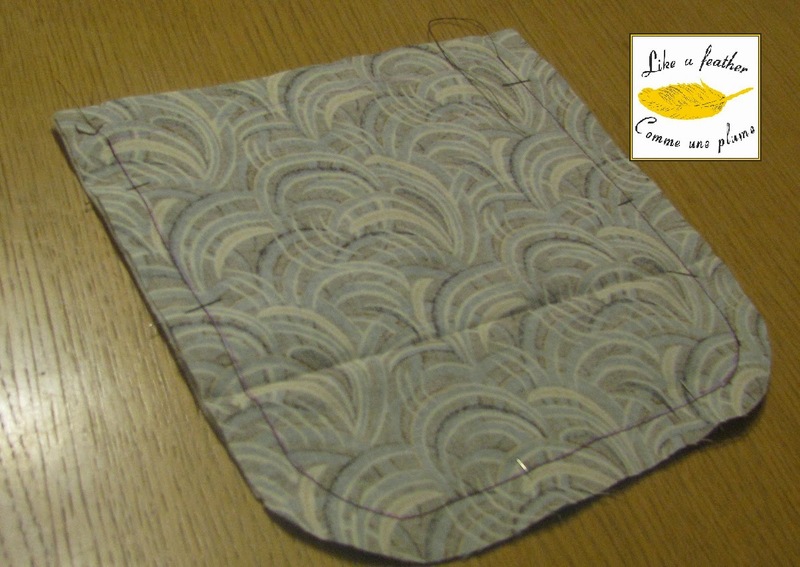 4/ Prepare the lining: sew two pieces of the bag in fabric 2 right sides together on three sides. 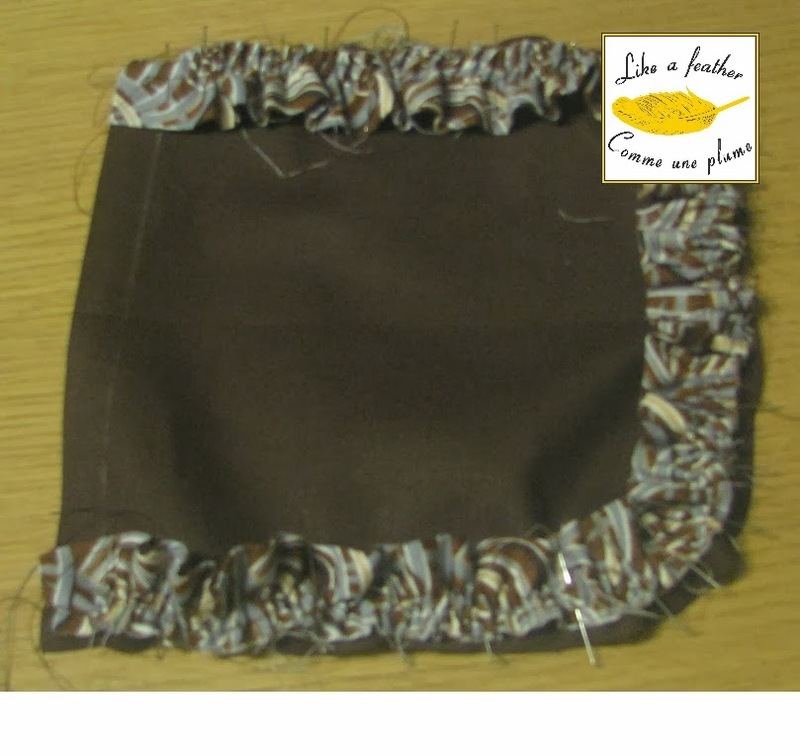 Do not sew to the borders of the fabric (app. 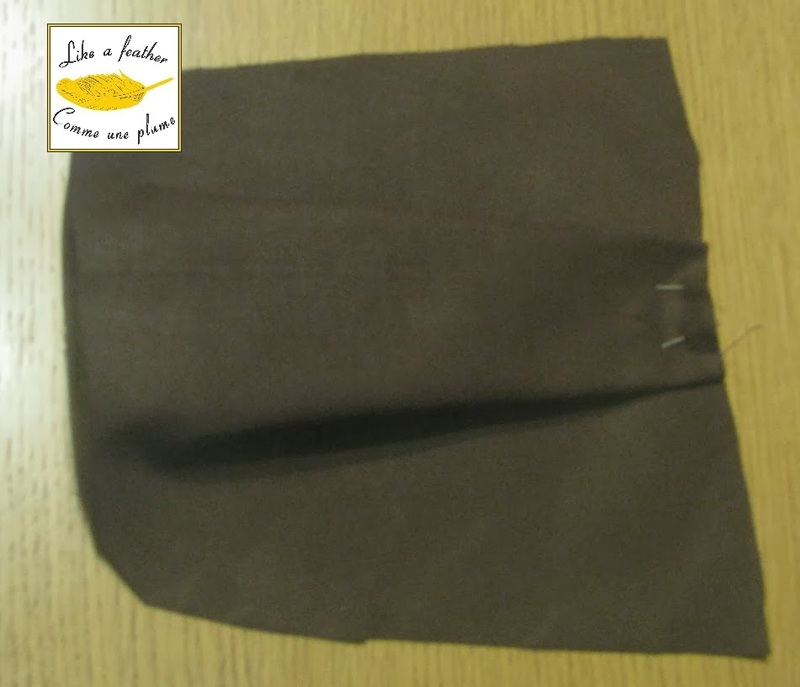 1 cm - seam allowance). 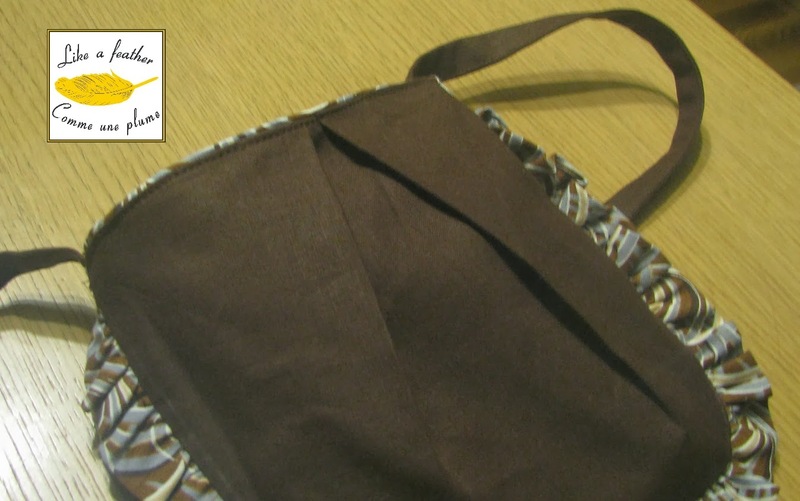 Turn the bag lining inside-out and press the borders. 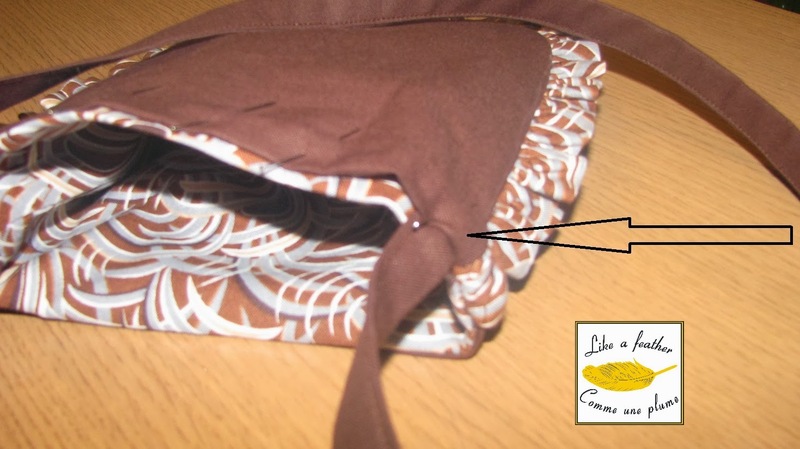 5/ Prepare the folds on the front piece of the bag: on the wrong side of the fabric pin the folds according to the markings on the pattern. 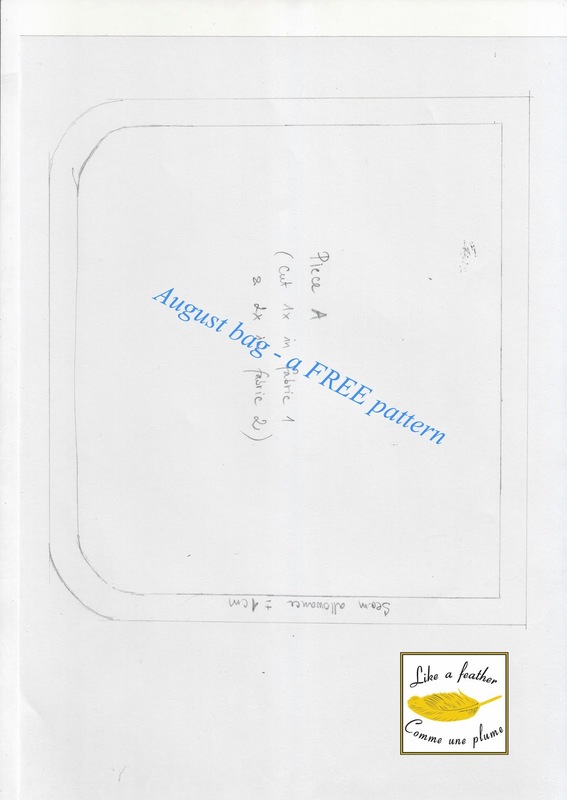 Please, disregard the white lines on the picture - I made this bag without pattern and I drafted the pattern for you afterwards, so now you are just to follow the markings on it. 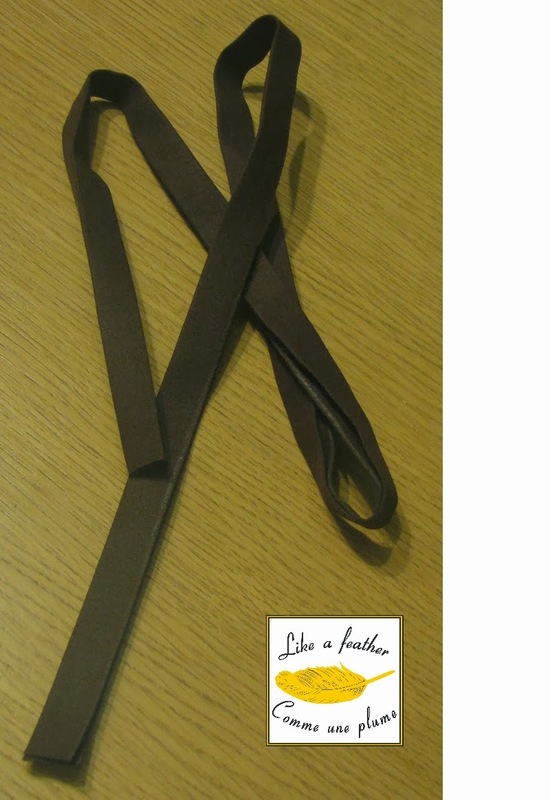 7/ Prepare the ruffle: fold the strip in half lengthwise and press. 8/ On the side of the opening, make two parallel lines (0.5 and 1.5 cm from the edge) in long points. 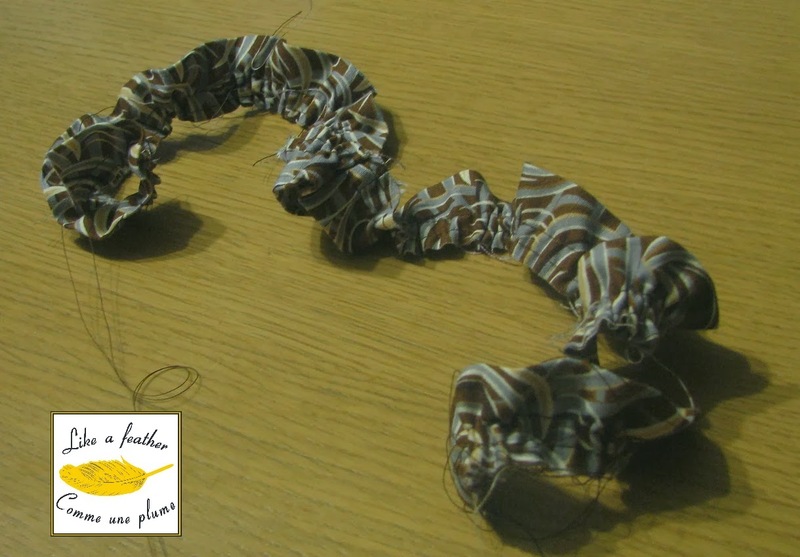 Pull both bobbin threads until you get the same length as the three edges of the bag on which you will sew the ruffle. 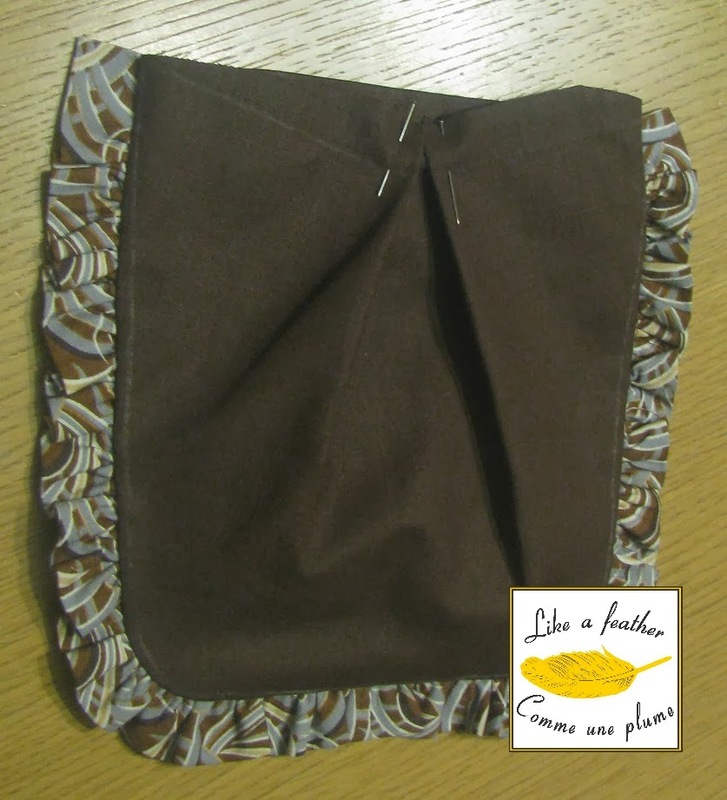 9/ Pin the ruffle on the three sides of the bag. 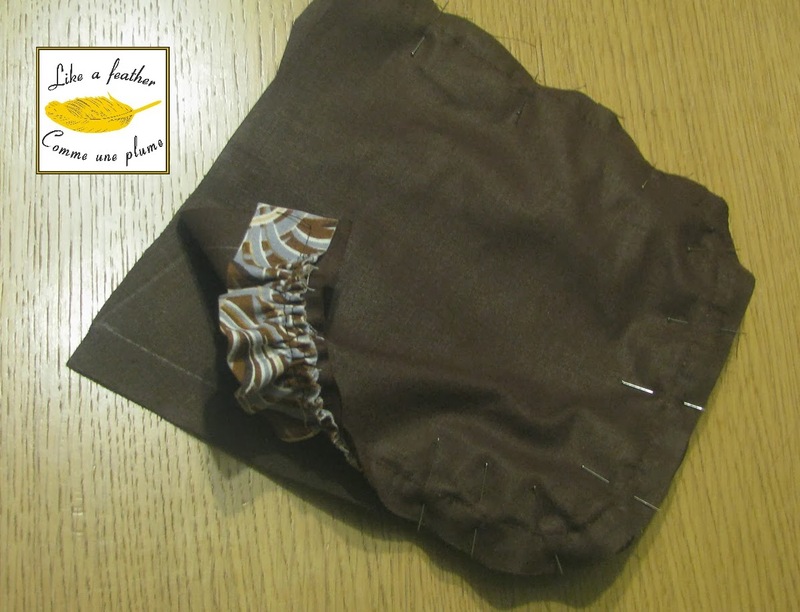 10/ Pin together the both pieces of the bag right sides together (while the ruffle is already pinned inside). 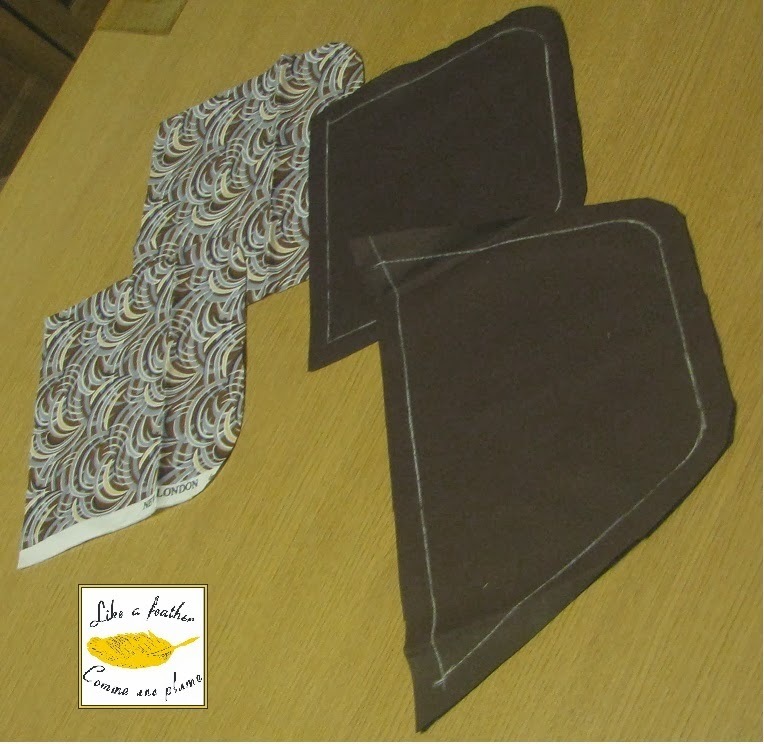 11/ Sew it together on the three sides. Turn it inside out and press. 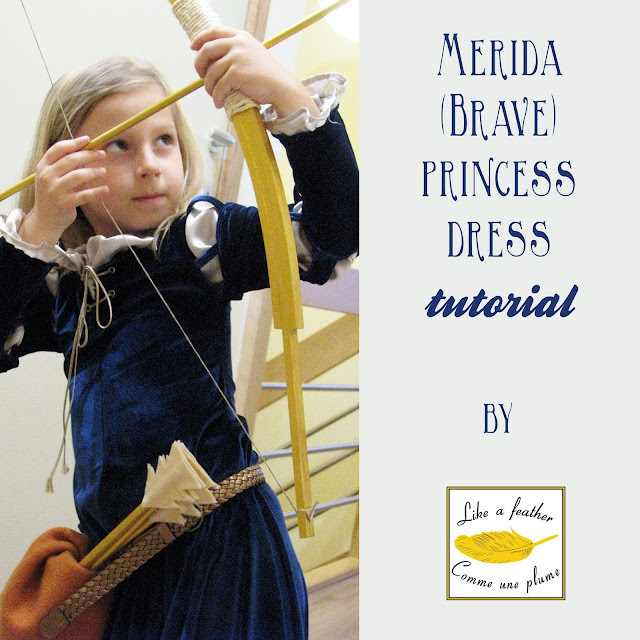 12/ On prepare the shoulder straps: fold both edges and press. 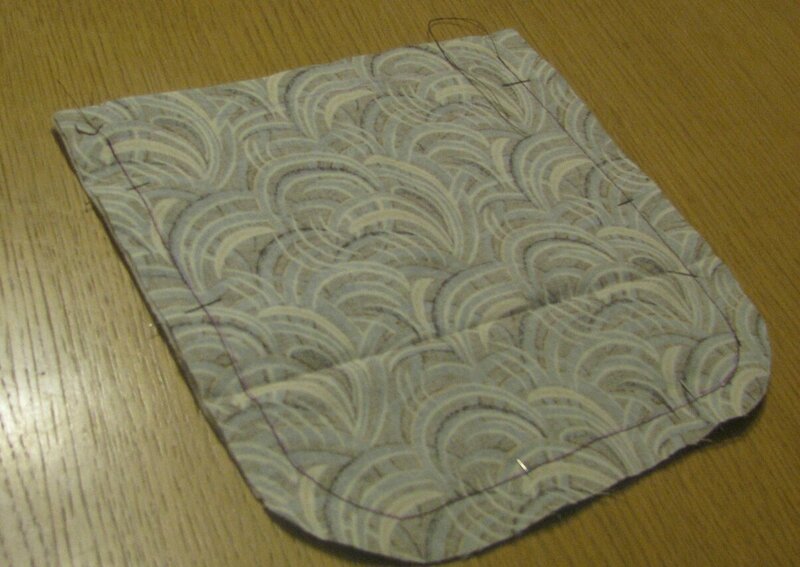 Then fold again in half, press and topstitch very close to edge. 13/ Now you will double the bag. 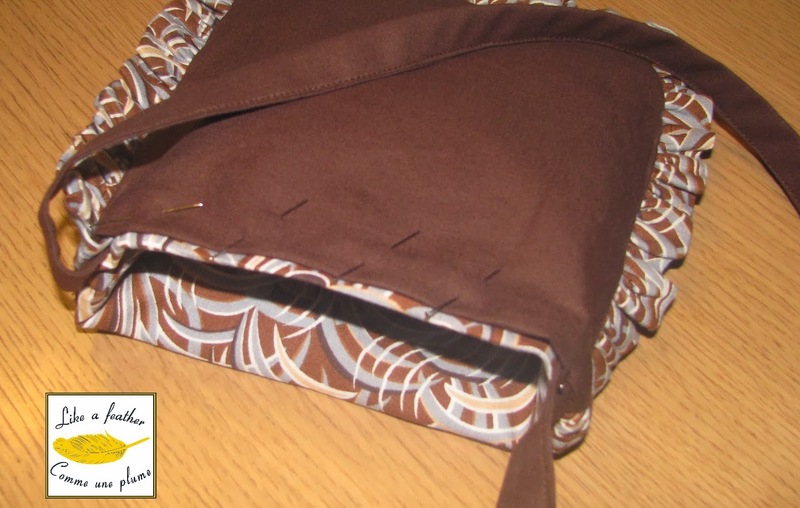 Sew the two bags (outer and lining) right sides together and leave a hole to be able to return it afterwards. 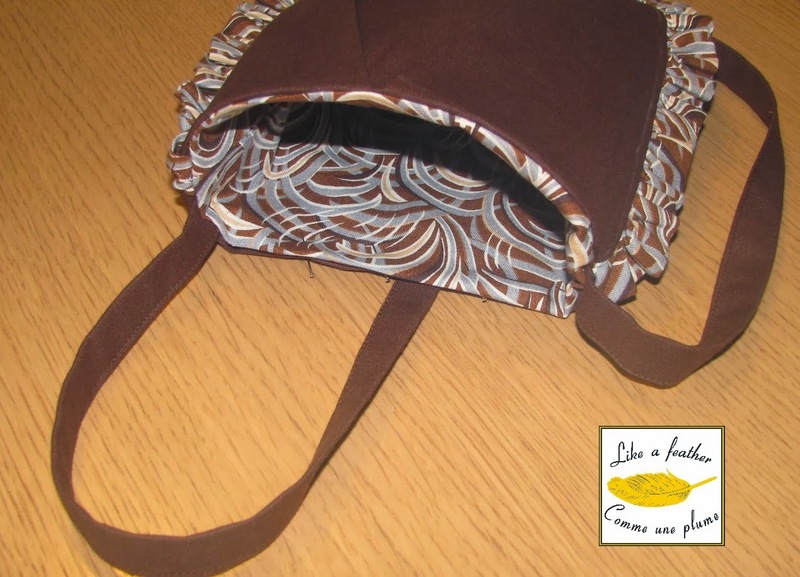 I pinned just half of the bag (from one end of the strap to the other) and I sew it. 14/ Then turn it (i.e. put the lining into the bag properly), press the edge already sewn and fold the rest which is still to be sewn. Then press the folded edges. 15/ Pin the rest of the bag all round. 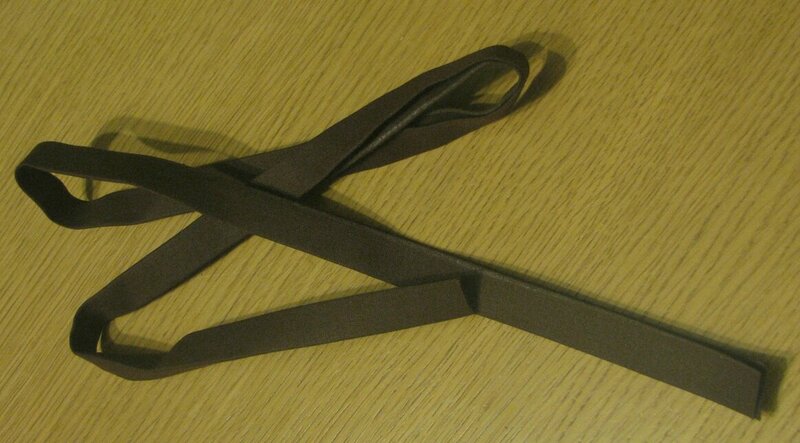 16/ Do not forget to pin and sew the straps, as well! 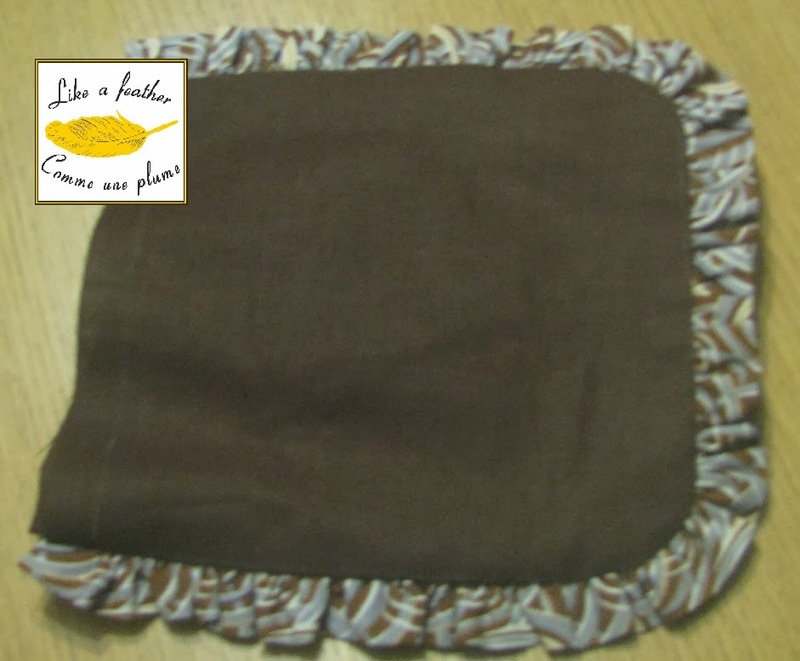 Me, I have decided to leave the edges of the lining exceed a little. 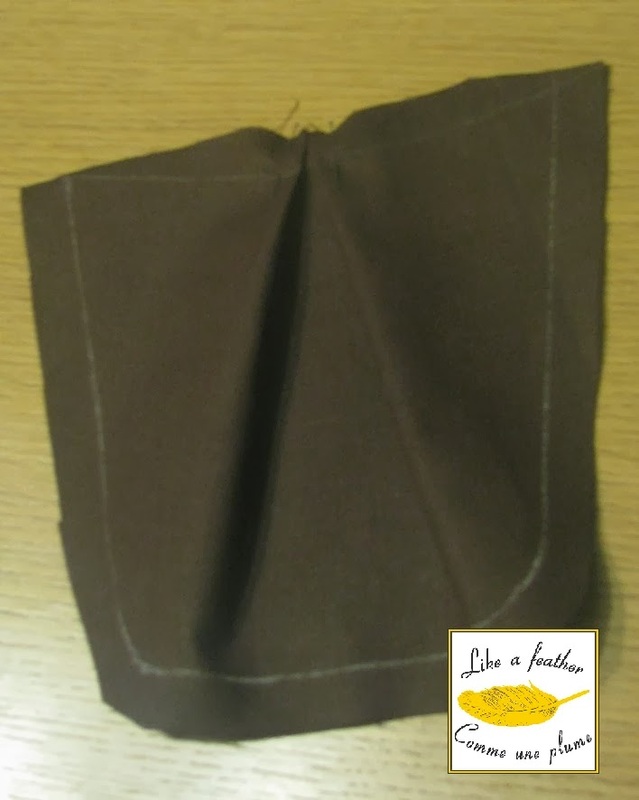 That´s up to you to decide whether you prefer the edges of your lining to be visible or not. Awesome pattern& tutorial! 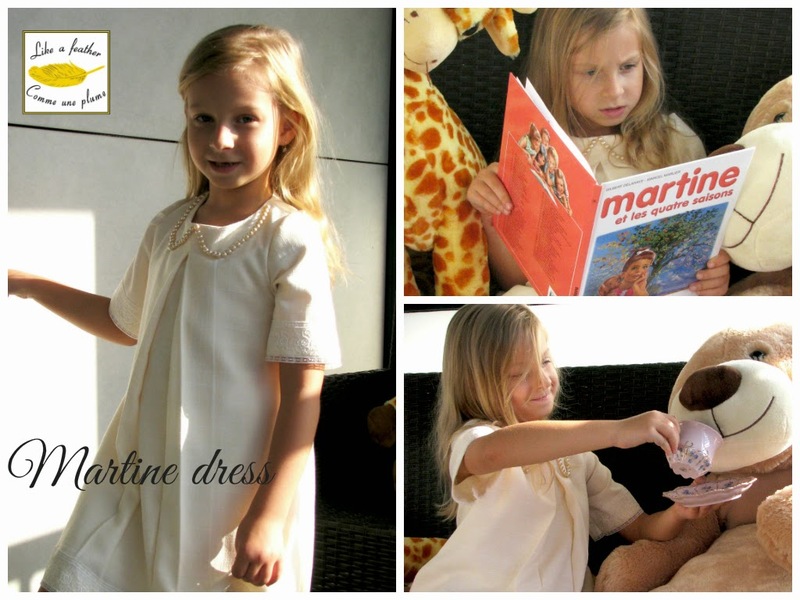 I'm pinning it:) I know everyone e will love it!